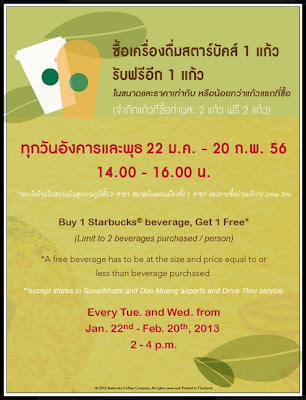 Starbucks is back with its Buy 1 Get 1 beverage offer every Tuesday and Wednesday afternoons, at 2 pm to 4 pm, from January 22 to February 20, 2013. 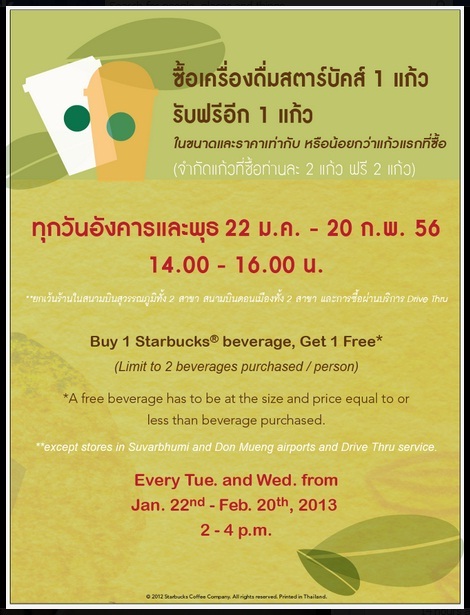 The promo is available at all Starbucks outlets, except those at the airports (Suvarbabhumi and Don Mueng), and the drive-thrus. There is a purchase limit of 2 beverages per person (+2 free), and the free one has to be sized and priced equal to or lesser than the purchased beverage.